It's almost February, so malls everywhere see their Calendars and More stores in severe discount. Calendars as cheap as 75% off are tempting, especially when you see one about the Pittsburgh Penguins. The 2016 poster, however... I'd avoid that. Found today at the mall, for the low low price of $4 (at the aforementioned 75% off), I was excited to find it was the last one. I was prepared to buy it. Then I flipped it over. The year starts promising enough. Evgeni Malkin in January is a great way to start the year! Then... it gets murky. Derrick Pouliot comes up in February. Prior to last week that would have been funny since he was buried in the minors. Now, whew. Way to get by. March is David Perron's month. Well he WAS just traded so okay, easy to let that go. But he's listed as number 39. Everyone knows that in the off season Perron switched to his usual #57. This was back in September. Whoops. 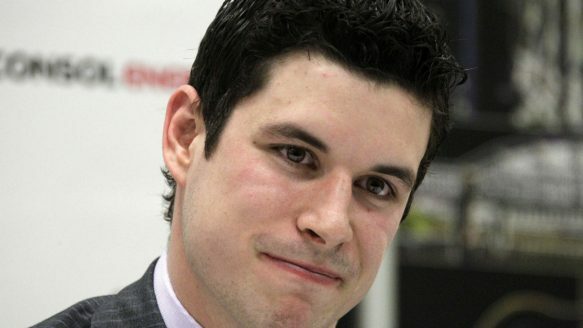 Crosby is in April. My birth month being April this is kosher with me! Jumping to May and oh my God Rob Scuderi is on a calendar why oh God why is Rob Scuderi on anything like this? Never mind that he was traded. Even if he hadn't been, why the hell is this guy on a calendar?! The next two months are the biggest puzzles there are. June and July are Nick Spaling and Brandon Sutter. Spaling was with the team for a cup of coffee, nothing more. He was traded on July 1st as part of the Phil Kessel package! JULY 1ST!!! Brandon Sutter was shipped out of town not long later on July 28th! How are these two players on this calendar?! Spaling was with the Penguins for one whole season and was traded five months before this calendar became effective! Ben Lovejoy in August and see May and Rob Scuderi. The rest of the year is not so bad. Chris Kunitz is September. October is Marc-Andre Fleury. Patric Hornqvist November, with Kris Letang December. With the way this calendar was made it's surprising Rico Fata wasn't September. Shocking that Ryan Malone wasn't October. Amazing that Kris Beech wasn't November and amazing that Brooks Orpik wasn't December. The fine print in the corner says "Please note: All players were under contract as of this printing." It's an interesting look in to the process of how calendars are made. This had to have been printed, at the latest, back in June for this to be not the work of just some lazy milennial intern. Either way, it's impressive that 1/3 of the players featured are no longer on the team. Anyway, if you see this calendar don't buy it. Or do. Whatever. It's not my $4. Just don't blame me when Nick Spaling in staring you down for an entire month.